This article is a brief introduction about Skill Based Routing (SBR) in relation with Ozeki VoIP SIP SDK. After reading through this page you will be fully familiar with all the essential terms concerning SBR technology and what you will need for creating your own solution using Ozeki VoIP SIP SDK. What does Skill Based Routing mean? This call routing technology can be supported by a well-structured IVR system that can automatically decide about the call routing according to the menu navigation steps the caller customer made. Ozeki VoIP SIP SDK has a great support for IVR systems that can give a stable basis for this kind of call routing procedure, you will only have to make the IVR tree, decide on the navigation technique and apply the IVR into your call center server application. Skill-based routing can be implemented as any other routing solutions using Ozeki VoIP SIP SDK. You only need to specify the skills to the call center agents and choose the most appropriate agent to transfer the call to. The transfer itself is done via blind transfer. 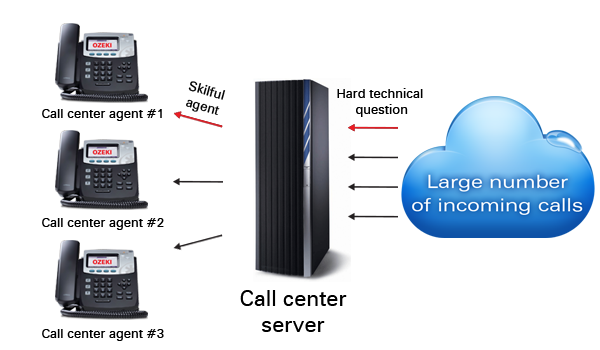 A possibility to set the call center agents' skills is to define a new class that stores the agent skills and set the actual agent's talents about all available skills in a 1 to 10 scale. Another possibility is to use a database with the skills and the routing process chooses the most appropriate agent according to a database query. Finding the proper agent can be difficult if a question needs more than one skill to be answered properly. Fo this purpose, you can use a characteristic function and make a bit checking on the agent skills, therefore you can find the most skilled agent for the answer. You also need to handle the fact that some agents will be not available for answering as they might be out of office or busy. In these cases you can choose the second or third best choice. About the basic concepts of call routing, you can read the Introduction to call routing page where you will find some example codes for this purpose. You can easily extend those examples with skill information and build a skill-based routing system. This article introduced you the basic knowledge about Skill Based Routing technology and showed how Ozeki VoIP SIP SDK can help you to fulfill your wishes about this topic. If you have read through this page carefully, you already have all the knowledge you need to start on your own solution.